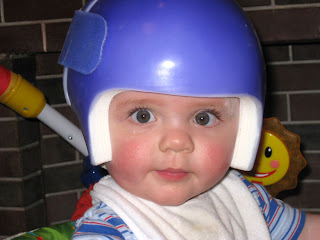 Or "cranial remolding orthoses"... but we prefer helmet! 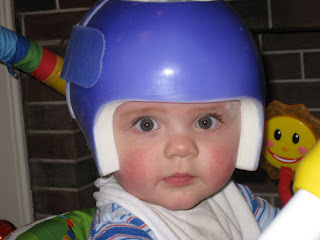 It's to help with his "deformational plagiocephaly"... but we prefer "funny-shaped head". We thought it would be blue, but it's kinda purple. We're gonna cover it with stickers. He doesn't seem to mind it, but we're only on day two so he hasn't slept with it yet. well, if anyone can pull it off, its that little guy!! 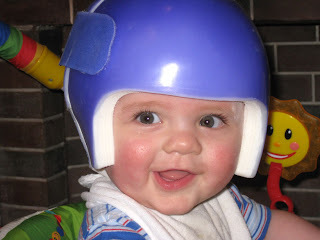 What a cutie - it's funny I would never have guessed he needed a helmet. I hope it was too stressful an experience. 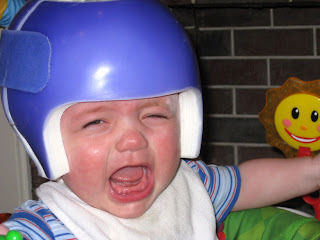 We've been dealing with comments about Penny's face tape - I'm trying to come up with a cute response. Blue...purple...he looks really cute in it!